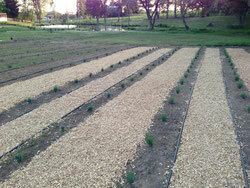 Our Story - Bywater Hollow Lavender- Bunz Family Farm! When Dan and Elizabeth Bunz purchased the 13.5 acre property in 1987, it was a bare cow property with a marshy bog in the center. For the past 28 years, Dan, Liz and their two daughters, Ashley and Courtney, have worked hard together to make the family property what it is today-- a little slice of heaven. "It has been a labor of love," says Elizabeth. The family spent many years dabbling in various farming activities and for a short time bred (on a small scale) Cleveland Bay & Irish Sport horses. When the girls were off in college and away from home for a few years, Dan & Liz found they had more time on their hands so, they spent a few years looking into various business ventures for their family farm. Despite their searching, they had yet to come up with the perfect fit...until 2011 when a trip to France left Dan & Liz awestruck and inspired by the lavender fields of Provence. The family quickly put their entrepreneurial minds to work and the idea of a lavender farm business was born! In April of 2012, Dan & Liz traveled to the Lavender Grower's Conference in Sequim, Washington where they attended seminars, toured the many successful lavender farms in the area, and came home bursting with excitement and ideas for the business. 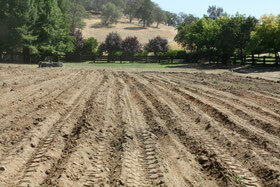 The hard work of field preparation commenced, immediately, in what was once the "front pasture" for the family's horses. 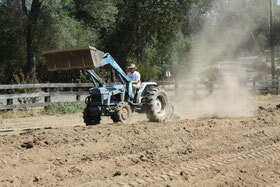 Then, in the fall of 2012, family and friends helped with the back-breaking task of planting more than 700 lavender plants! Danny comes from a long line of farmers, while Elizabeth's farming background comes from having been born and raised in a small country village, in England, where she spent her formative years developing her natural farming sense and her green thumb. Together, for a few decades now, the two (along with their daughters) have gained a great deal of experience in farming practices by simply working their land, experimenting, and navigating A LOT of trial-and-error over the years. The planting and maintenance of the lavender field has been no different...it has been a learning experience and a bumpy ride at times. But, the Bunzs have taken it all in-stride and, in the summer of 2014, opened their farm to the public for the bloom season. The farm opened for the first time on Friday, June 20th, 2014 and closed for the season on the 4th of August. "Our inaugural season was shorter than expected due to weather conditions, which affected the lavender bloom," said Liz, "nevertheless, we had a wonderful (although HOT) summer in our little chicken coop farm 'boutique.'" Many friends, old and new, stopped by to pick fresh lavender, purchase our homemade products, or just relax, chat, and enjoy the scenery. In the off-season of 2014-2015, the family was hard at work making changes and major upgrades to the shop, which is now larger, cooler and much more luxurious than the previous location next to the chicken coop. Not to mention the Bunzs planted quite a bit more lavender! Perfectly located along the beautiful Placer County Wine Trail, among many award-winning boutique wineries, and near to the fantastic hiking trails of Hidden Falls Regional Park, Bywater Hollow offers visitors added value to their leisure activities in the Placer County countryside. **Recognize the name Bunz? --Roseville, California native Danny Bunz is a former San Francisco 49er and two-time Super Bowl Champion. Dan’s distinguished eight-year career in the NFL began in 1978, when he was drafted in the first round by the San Francisco 49ers. He was the 49ers Rookie of the Year in 1978, and played a pivotal role in the 49ers’ wins in Super Bowls XVI and XIX. Dan’s game-saving tackle of Bengal running back Charles Alexander in Super Bowl XVI is known to most 49er fans as simply “The Stop” and to this day is listed as one of the top ten tackles in Super Bowl History. **You may also recognize the name Bunz from Dr. Roullier-Bunz, D.D.S. Liz has been a popular dentist in Rocklin since 1985, named “Best of the Best” by local media and truly loved by her long-time, multi-generational patients. Liz retired from dental practice in May 2014 in order to devote more time to the farm.